Easter Monday (Apr. 22nd) – closed. Christmas Eve (Dec. 24th) – closed. New Years’ Eve (Dec. 31st) – OPEN. Hours of operation are subject to change. The Public Drop Off Depot is closed on Sundays and major holidays. The Public Drop Off Depot is open year round, six days a week. The Public Drop Off Depot accepts many different types of materials including: electronic items, garbage, household chemical waste, recyclables, scrap metal, tires, white goods (appliances), and yard waste. 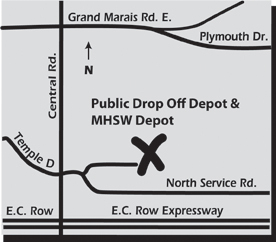 The Public Drop Off Depot is open to both residents and businesses. Some items are assessed a tipping fee while others are not. Please refer to the current tipping fee schedule for materials and rates. Note: Rates are subject to change without notice. Listed below are all the payments methods currently accepted at the Public Drop Off Depot. All garbage is assessed a tipping fee or a user fee. Residents can drop off the following products – free of charge. Please note, this list is not comprehensive – this is just a sample of the types of products accepted. For more information regarding household chemical waste please refer to the Municipal Household Special Waste section of the website. There are designated bins available at the Public Drop Off Depot for items that are considered recyclable. Residents and businesses can drop-off the following recyclable materials free of charge. Scrap metal items (i.e. swing sets, barbeques, etc.) can be dropped off free of charge. Look for the designated scrap metal bin at the Public Drop Off Depot.